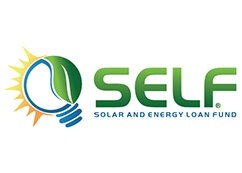 Solar and Energy Loan Fund is a Florida Not For Profit Corporation which provides Floridians with affordable financing for numerous energy efficiency upgrades including solar energy installations. SELF was founded in 2010 and is headquartered in Fort Pierce, FL. SELF’s mission is to help rebuild and empower underserved communities by providing access to affordable financing for sustainable property improvements including: energy efficiency; renewable energy; wind-hazard mitigation; and, water conservation. SELF provides affordable loans coupled with financial education, energy expertise and project management to help their clients make the most cost-effective decisions. SELF’s loans help people save costs on energy and insurance premiums, while also helping preserve a healthy environment through reducing carbon emissions. SELF ensures competitive pricing and quality work from their network of over 165 pre-approved contractors who are located all over the state of Florida. Solar and Energy Loan Fund is a leader in PV solar financing, but is financing through SELF right for you? Contact your local Uptown Energy Solutions consultant and they’ll help you identify what solar modules your local installers are offering, what inverter each recommends your modules be paired with, and what they would charge to have the whole system installed now. On top of that, your UES Solar Energy Consultant will do a full design analysis of each installer’s proposed system, compare its expected production with it’s quoted costs, and determine which will give you the most “bang for your buck”, all as part of your Gold Standard Solar Investment Strategy. Contact us today for a no nonsense approach to your solar investment, and let us help you Maximize your Solar ROI. Questions, comments, or corrections? Feel free to contact us.